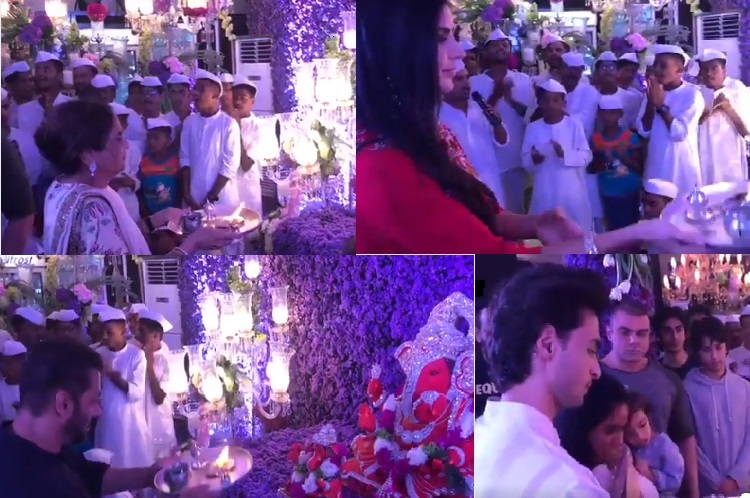 Salman Khan and family along with Katrina Kaif perform Ganesha aarti at Arpita Khan Sharma's residence in Mumbai. Alvira's husband and producer Atul Agnihotri shared a video of the family including Salman Khan, Salma Khan, Arpita Khan Sharma, Sohail Khan, Arbaaz Khan, Alvira Khan Agnihotri performing the aarti and Katrina Kaif has also joined them. Salman Khan rumoured girlfriend Iulia Vantur was also spotted outside Arpita's residence. Earlier Arpita posed in front of media with husband Ayush Sharma and sister Alvira also posed for the media. Atul Agnihotri shared the video and captioned it, "#GanapatiBappaMoraya @beingsalmankhan @arbaazkhanofficial @sohailkhanofficial @arpitakhansharma @aaysharma @alizehagnihotri @nirvankhan15 @iamarhaankhan @katrinakaif"